Browsing through Pinterest, I became inspired by this rustic receipt holder. Cruising the aisles of Hobby Lobby I was able to find the necessary supplies. 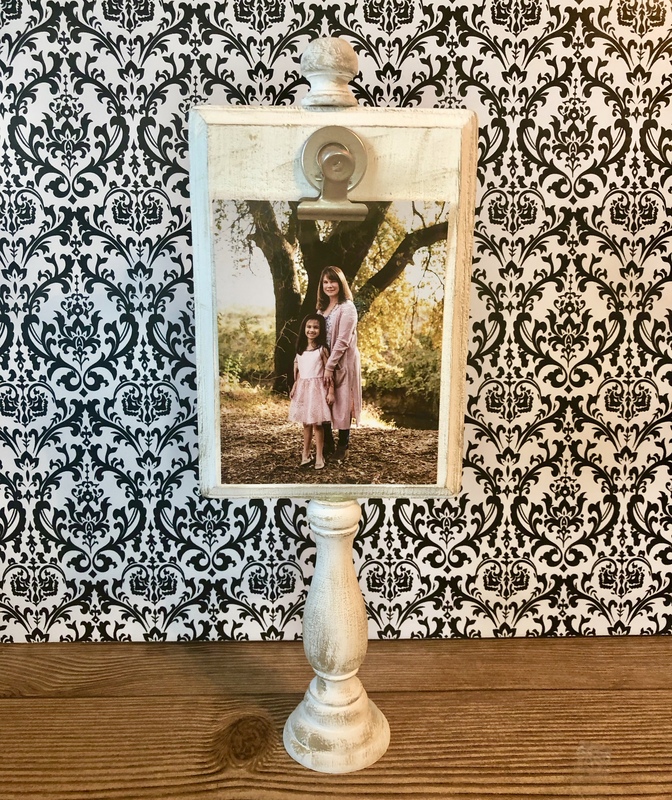 I set about figuring out how to make my own rustic wood photo holder. 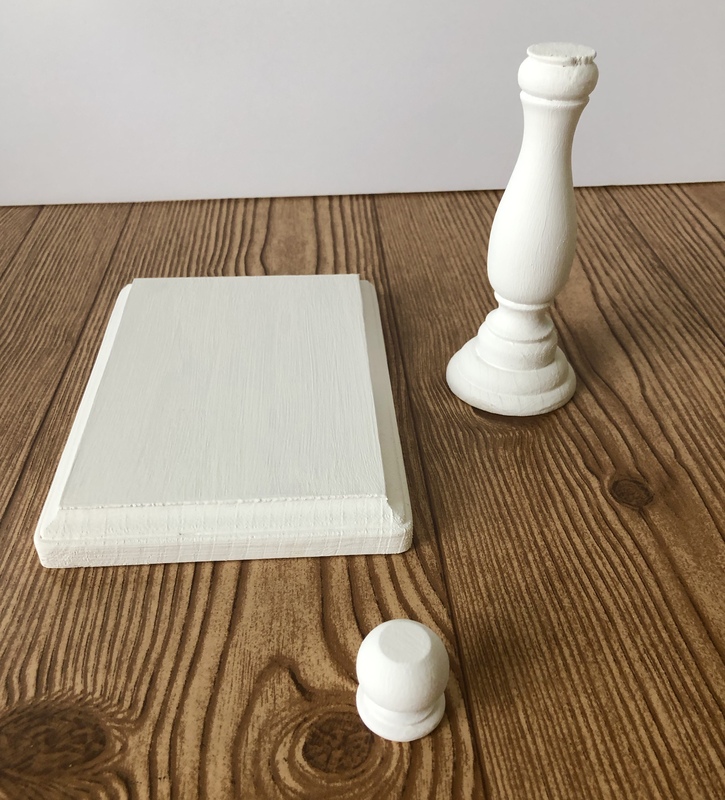 The makings for your rustic wood photo holder. Wood candlestick-available at Michaels or Hobby Lobby. If you do not have access to a saw Amazon has a pack of 3 short candlesticks for a great price. Wood finial-found mine at Hobby Lobby. If you are making several, Amazon has a pack of six for a good price. Metal magnetic clip-I picked up a pack at the dollar store. Amazon sells some fun colored ones. Two coats of white paint. You can lightly sand some of the white paint off, however, I prefer to dry brush Lichen Grey over the white to give it the aged appearance. 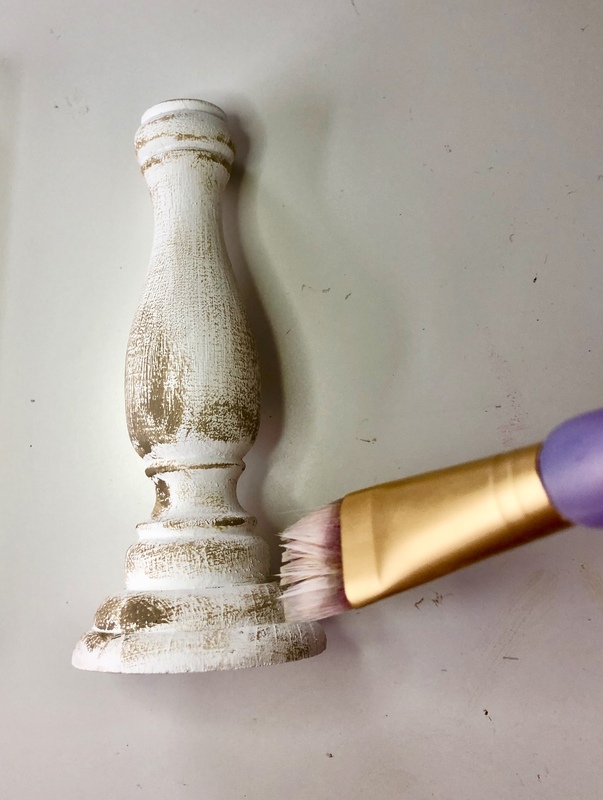 This requires a bristled paint brush, not a foam brush. Load a small amount of paint on to the brush. 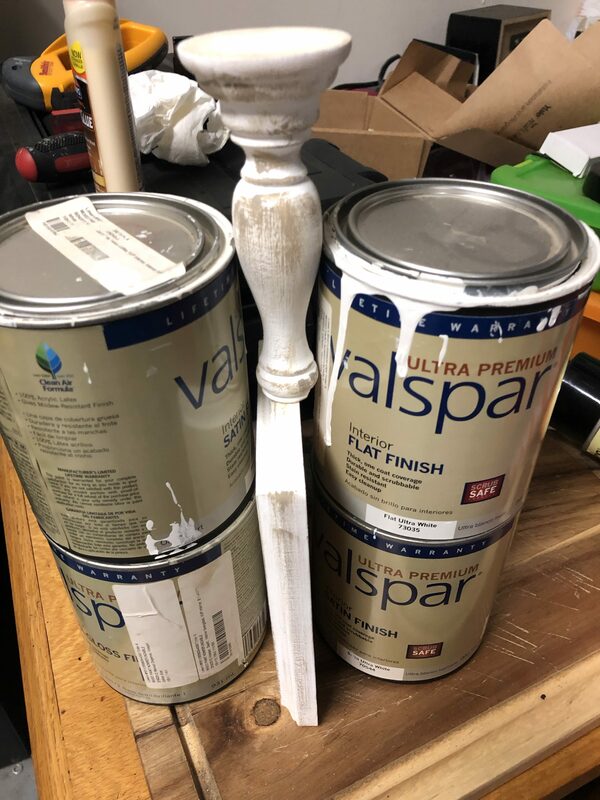 Load about 1/4″ paint on to the brush. I use a foil scrap when I paint for easy cleanup. After loading the paintbrush wipe it on the foil a couple of times to get excess paint off. 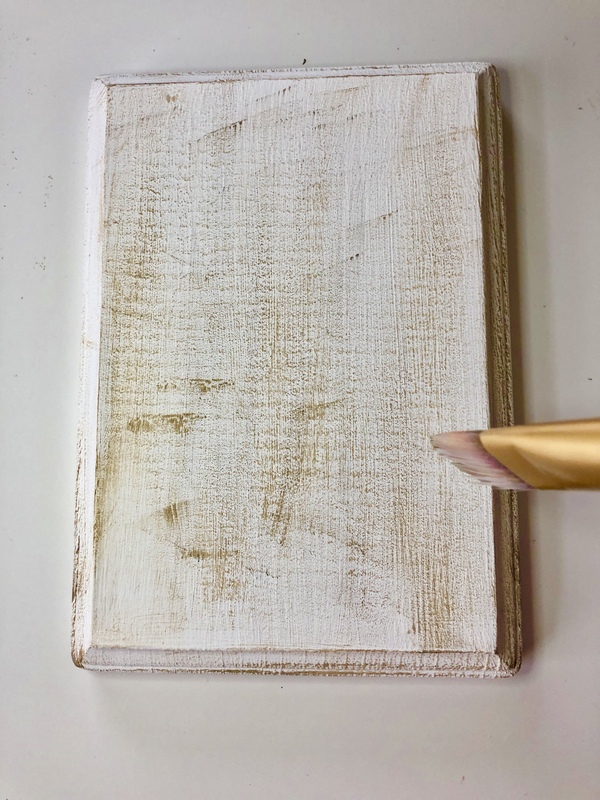 If there is still too much paint blot it on a paper towel so that the brush is nearly dry. Then dry brush the Lichen Grey paint lightly over the white. Applying more to edges and sides. Gorilla Glue for hot glue guns is just about the best thing ever. The only drawback is it seems to take a little longer to dry than regular hot glue. So I had to get a little creative to hold the plaque in place while the glue was drying. My makeshift clamp to hold the wood together while it dried. Once the bottom is dry, glue the finial on the center top. 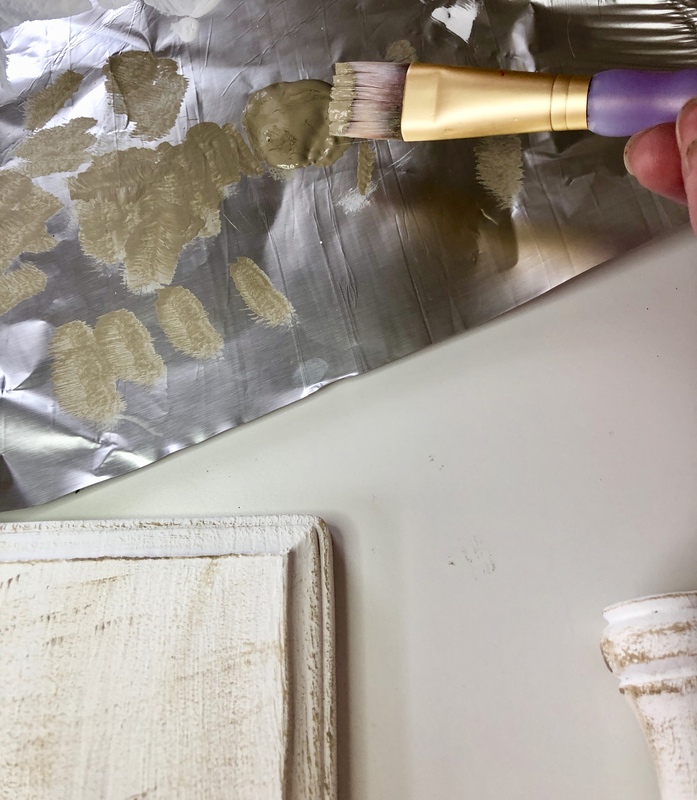 Spray the metal clip with the metallic spray paint and apply to the front of the frame with the Gorilla Glue. This makes a cute sign holder as well. Once I was done, I thought it was a shame the back was plain. I got the idea to make the back into a chalkboard. 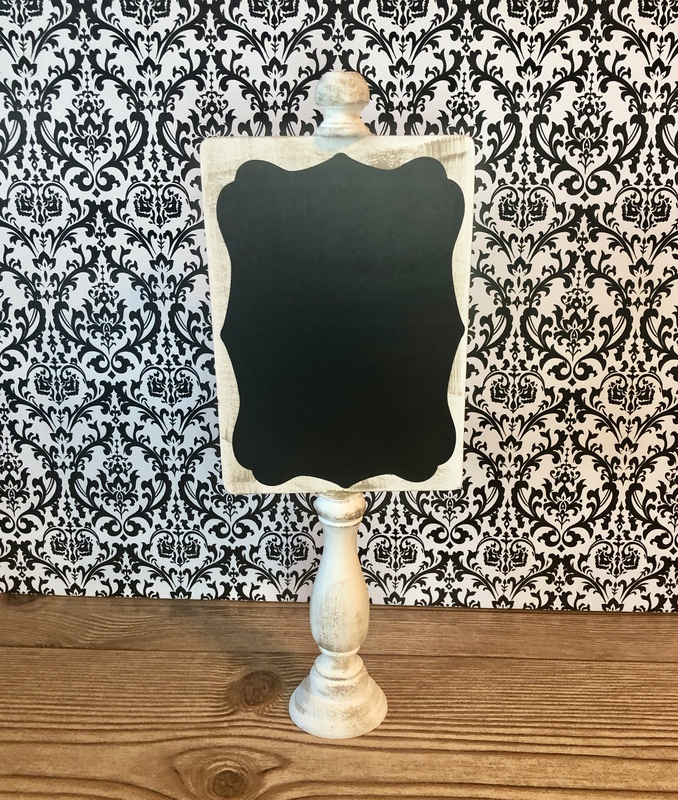 Using Cricut Chalkboard vinyl, I cut a frame shape in Design Space. This was the first time I used the chalkboard vinyl. The first time I tried cutting it, the blade didn’t penetrate the vinyl at all. 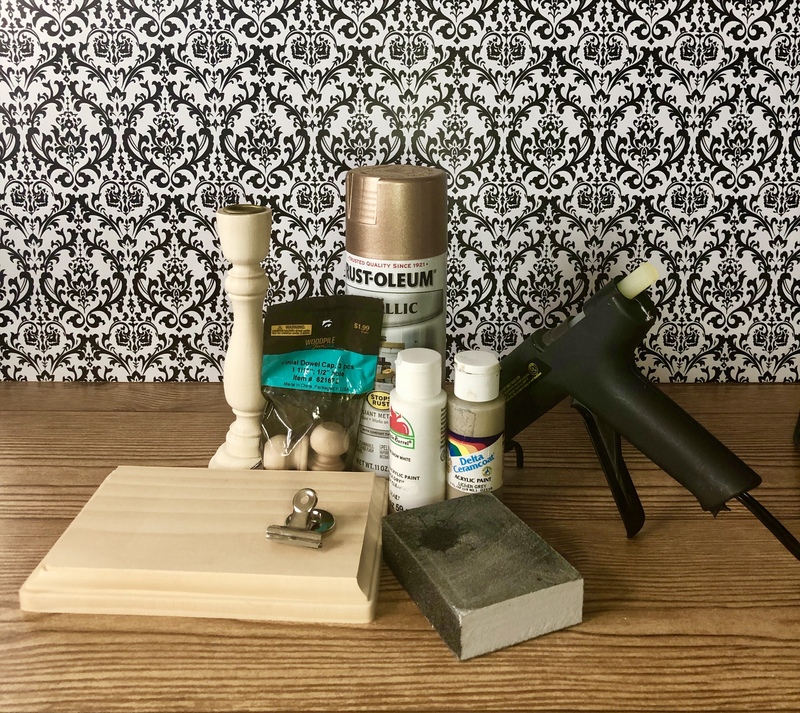 You will need to use a deep cut blade and to set your Cricut to custom and select chalkboard vinyl in order to get the vinyl to cut all the way through. My afterthought turned out so cute! I love anything that performs double duty. 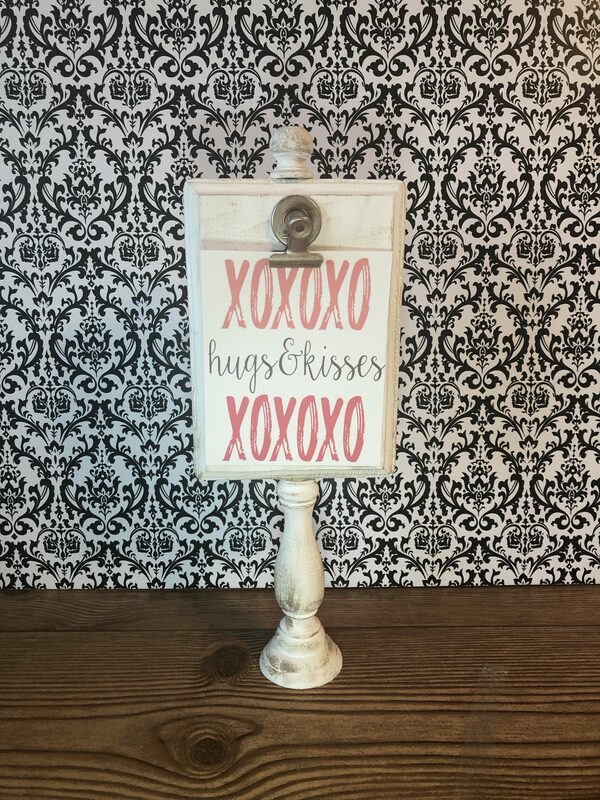 This is such a cute tabletop sign!